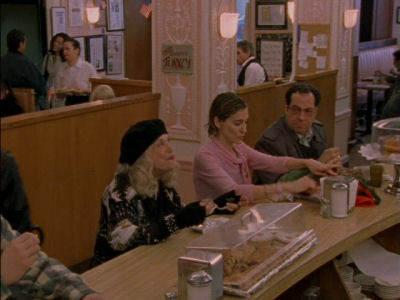 The Television Crossover Universe: Thomas Edison: Hero or Villain? 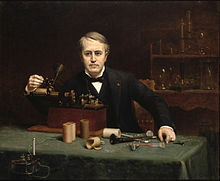 February 11, 1847--Birth of Thomas Edison. 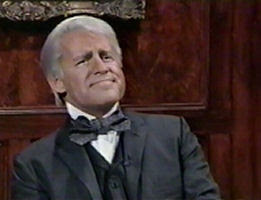 Click here for a list of appearances of Edison portrayed by actors on screen. 1868--JONAH HEX # 22--Jonah Hex, a classic comic book western hero, recently had an adventure with Thomas Edison, as shown in Jonah Hex v2 #22 (2007). The villain of the story cited The Steam Man of the Prairies as an influence. 1876--Birth of Thomas Alva Edison Jr.
1878--TOM EDISON'S SHAGGY DOG--Tom Edison's Shaggy Dog by Kurt Vonnegut (1953). A short story about Edison's accidental discovery that dogs have superhuman intelligence (and can talk) while working on an intelligence analyzer invention. Edison's dog Sparky reveals that dogs keep their intelligence a closely guarded secret, as they live a life of luxury while their humans "owners" do all the work & have all the worries. Edison and his young neighbor are featured in the story (told as a flashback from the now elderly neighbor's point of view), which goes on to divulge that it was Sparky who suggested to Edison the crucial component of the first incandescent light bulb. 1884--Nikola Tesla comes to the Unites States to work for Edison. 1886--L'EVE FUTURE--L'Ève Future, an 1886 novel by Auguste Villiers de l'Isle-Adam that popularized the term 'android.' 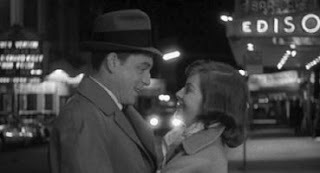 In it, a fictionalized Edison creates what he argues is the perfect woman, the android Hadaly, in order to cure his friend Lord Ewald's infatuation with singer named Alicia, who is represented as shallow and immoral. 1890s--THE MURDOCH MYSTERIES--Edison appears twice in this series. Fall 1890--TOM EDISON, JR.'S SKY-SCRAPING TRIP; OR OVER THE WILD WEST LIKE A FLYING SQUIRREL--First adventure of Tom Edison's son. The author, throughout the series, works very hard to let us know that Tom Edison, Jr. is not the real Tom Edison, Jr., nor is his father, the fictional famed inventor, meant to be the real life famed inventor of the same name, but let's be real. Of course it is. 1891 to 1892--A series of stories featuring "Tom Edison, Jr." by Philip Reade were published between 1891 and 1892. Interestingly, the story "Tom Edison's Electric Mule, or, The Snorting Wonder of the Plains" (1892) is a parody of the earlier Frank Reade series. 1898--EDISON'S CONQUEST OF MARS--Thomas Edison himself was the main character in Edison's Conquest of Mars by Garrett P. Serviss (1898), a sequel to Fighters from Mars (in the form of a revenge fantasy) an unauthorized and altered adaptation of Wells's The War of the Worlds. Another real and famous inventor to appear in one of the stories was Nikola Tesla in To Mars With Tesla; or, the Mystery of the Hidden World. 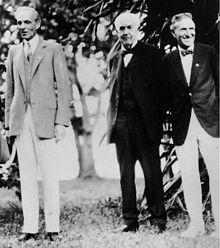 ?--EPIC RAP BATTLES OF HISTORY--Edison appears in the second series of YouTube series Epic Rap Battles of History, in a rap battle against Nikola Tesla. October 1899--THE FIVE FISTS OF SCIENCE--Nikola Tesla, Baroness Bertha von Suttner, and Mark Twain team up to create a weapon that they help will force the world's nations to declare peace. J.P. Morgan, Thomas Edison, Andrew Carnegie, and Guglielmo Marconi join forces to stop them. The "heroes", though I guess that depends on the perspective, are building the Innsmouth Tower in New York, and have a captured Migou (Mi-Go), both references to Lovecraftian horror. Circa 1900--THE EDISON EFFECT--Edison appears in and lends his name to "The Edison Effect", the fourth Professor Bradshaw Mystery by Bernadette Pajer. 1901--TO MARS WITH TESLA; OR, THE MYSTERY OF THE HIDDEN WORLD--To Mars With Tesla; or, the Mystery of the Hidden World by J. Weldon Cobb (1901) featured "Young Edison", a fictional nephew of Thomas Edison, helping Nikola Tesla in his adventures with Martians. 1902--ANOTHER PERIOD--"Rejects Beach"--Lillian's new friends invite her to a beach party, and Beatrice is brought to Thomas Edison for a forbidden experiment. Blanche receives a mysterious letter from the Triangle Shirtwaist Factory, and Garfield tries to keep the family from falling apart. September 13 - 18, 1909--TARZAN # 13 - 14--"THE MODERN PROMETHEUS"--During the events of TARZAN OF THE APES, Tarzan is in New York where he meets Sir Arthur Conan Doyle, Nikola Tesla, Thomas Edison, and Frankenstein's Monster. February 1916--YOUNG INDIANA JONES CHRONICLES--"Princeton, February 1916: Race to Danger"--Young Indy meets Thomas Edison. 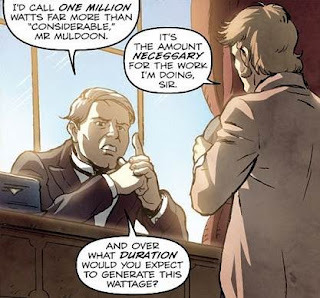 Thomas Edison has also appeared on TARZAN (DARK HORSE COMICS), and VOYAGERS. Spring 1918--G-8 AND HIS BATTLE ACES--"Grun-The Green Terror!" --Herr Grun and Herr Doktor Krueger meet for the first time. Krueger is in possession of the "Einstein-Steinmetz-Edison time dislocator". The Story: Thomas Edison uses his psychophone to summon the ghost of Rasputin in order to send him after Atomic Robo. Notes: Though Rasputin is based on a real historical figure who has also become part of folklore, this is the particular version of Rasputin who fought Hellboy. 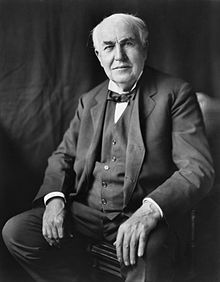 Thomas Edison has been portrayed in fiction both within and outside the Horror Universe as a hero and a villain. Perhaps he suffered from multiple personality disorder. 1930s--ATOMIC ROBO AND THE DEADLY ART OF SCIENCE--Classy James Bojaciuk informs: Atomic Robo and the Deadly Art of Science deals heavily with Mr. Tesla: and, among other things, implicates him in the death of Thomas Edison, the disappearance of the Crystal Skull, and the invention of Tony Stark's Iron Man armor. Atomic Robo is filled, uitterly overflowingly filled, with crossovers. The crossovers range from cute little references to issue long crossoverfests. It's amazing. The art's great--the writing is fantastic. 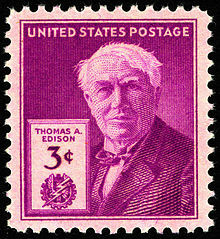 October 18, 1931--Death of Thomas Edison. 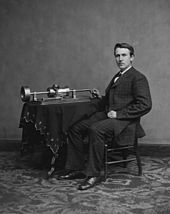 1935--Death of Thomas Alva Edison Jr.
1953--S.H.I.E.L.D. #5--From James Bojaciuk: Because of the presence of Mr. Fantastic and Iron Man's fathers, it was a safe bet that the S.H.I.E.L.D. comics occurred in the TVCU--but in the bonus stuff included in the back of #5, there is a piece on the Forever Machines of Nikola Tesla. One of these is The Five Fists of Science, which is a "coded historical record." This is a reference to Matt Fraction and Steven Sander's graphic novel, The Five Fists of Science. In that, Nikola Tesla and Mark Twain teamed up to fight Edison and Cthulhu. 1991--BILL & TED'S BOGUS JOURNEY--Edison is in Heaven. 1995--THE TICK--"Leonardo da Vinci and His Fightin' Genius Time Commandos!" --Famous inventors from throughout history help the Tick fight a super-villain who wants to change history. 1996--EXPIRATION DATE--Expiration Date by Tim Powers in which a boy possessed by the spirit of Thomas Edison is hunted through Los Angeles by people wanting to consume the ghost he carries. 1998--THE SIMPSONS--"The Wizard of Evergreen Terrace"--In The Simpsons season 10 episode The Wizard of Evergreen Terrace, Homer Simpson tries to compete against Edison when he learned much of his history and tries to invent newer things. 1999--CARMEN SANDIEGO'S GREAT CHASE THROUGH TIME--Master thief Carmen Sandiego has a time machine called Chronoskimmer and plans to steal historical reaches, such as the Declaration of Independence. Travel to various eras, find out why she's there and stop her plan. Edison appears. 2001 to 2002--CLONE HIGH--In the cartoon series Clone High, Thomas Edison's clone is shown as a short, sniveling nerd who seems to spend most of his time working with A.V equipment (a reference to the fact that Edison invented the projector). 2008--TALES FROM THE BULLY PULPIT--Our researcher, John D Lindsey Jr, reports: Basically, Teddy Roosevelt and the ghost of ThomasEdison use HG Wells' stolen time machine to visit 2008 and fight Nazis on Mars. Indiana Jones turns up on a wanted poster. Edison mentions Hitler stealing the Ark of the Covenant (Raiders), having his brain planted inside a gorilla (The Savage Dragon) and disguising himself as an Asian man to build giant robots (no idea). Also, there's a one panel cameo of a humanoid mouse wearing a Star of David, a shoutout to the comic Maus. 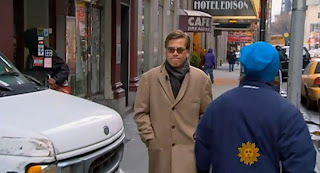 2012--NIGHT OF THE NYCTALOPE--"The Ides of Mars"--Nyctalope takes on the "last Martian". 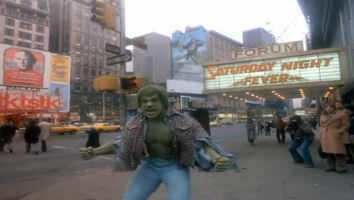 Other crossovers include: MARTIN MYSTERE, THE BLACK COATS, TOM EDISION JR., and DOCTOR MYSTERE. 2012--ASSASSIN'S CREED--In the Assassin's Creed series, Edison is portrayed as a member of The Knights Templar and one of the founders of the Abstergo Industries, attempting to discredit Nikola Tesla, an ally of the Assassins Order. 2012--WAREHOUSE 13: GRAND DESIGNS--"Chapter 1"--Thomas Edison appears. 2013--CAPTAIN MARVEL # 14--The first supervillain that Ms. Marvel (Kamala Khan) encountered was The Inventor, a failed clone of Edison who's DNA was contaminated by his' creators' pet cockatiel. 2015--KAMEN RIDER GHOST--In the Japanese tokusatsu, Kamen Rider Ghost, the ghost of Thomas Edison helps the main character Takeru Tenkuji/Kamen Rider Ghost to unite the 15 Heroic Spirits and to access his electricity/gun-wielding Edison Damashii form. ALIEN NATION--Edison appears in episode "The Game". CARTOON UNIVERSE--Edison appears in THIS IS AMERICA, CHARLIE BROWN. EDISONADE UNIVERSE--And Having Writ..., a 1978 alternate universe novel by Donald R. Bensen, features four aliens stranded on Earth whose comic misadventures lead to Edison being chosen by the Republican National Committee to run for President of the United States instead ofSecretary of War William Howard Taft in 1908. He wins and becomes the 27th president. In 1912, he decides not to run for a second term and is succeeded by former president Theodore Roosevelt, who also preceded him. TVCU-3--Edison appears in Houdini and Doyle. UNIVERSE OF WONDER--"JLA: Age of Wonder" (2003) was a two-issue mini-series from DC's Elseworlds line, in which Superman landed in Kansas in the 1850s and emerged on the world stage at the 1876 Centennial Exposition. He teams up with Edison but ends up working with Tesla.